Notice that Graph B has been shifted vertically downward by one unit. 4. Compare outputs for corresponding inputs for the f and g functions. What do you notice? 5. Using function notation such as f(x)= _______, write a formula for the function in Table A. 6. Using function notation such as g(x) = _______, write a formula for the function in Table B. 8. Does this transformation primarily affect input or output values ? Notice that Graph B has been shifted horizontally to the right by two units . 4. Compare inputs for corresponding outputs for the f and g functions. What do you notice? 8. Does this transformation primarily affect input or output values? the x-axis, what happens to the y- coordinate values ? Explain. 6. When the graph of y = f(x) is reflected across the x-axis, how does the equation change? 7. Does this transformation primarily affect input or output values? the y-axis, what happens to the x-coordinate values? Explain. 13. When the graph of y = f(x) is reflected across the y-axis, how does the equation change? 14. Does this transformation primarily affect input or output values? 1. On each set of axes, draw a graph that is symmetric about the y-axis. 2. 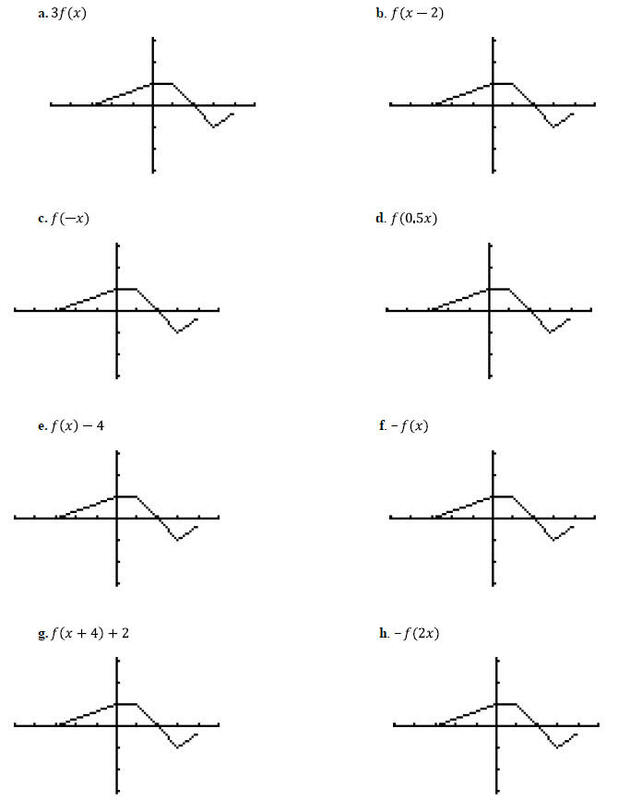 On each set of axes, draw a graph that is symmetric about the origin. about the origin is called an ODD function. a. Give the formula for the function that transforms j(x) by shifting its graph down 4.
b. Give the formula for the function that transforms j(x) by shifting its graph to the right 5.
c. Give the formula for the function that transforms j(x) by reflecting it over the y-axis. d. Give the formula for the function that transforms j(x) by shifting its graph up 6 and left 2.
e. Give the formula for the function that transforms j(x) by shifting its graph down 7 and reflects over the x-axis. 5. Describe how function g is a transformation of function f in #1. 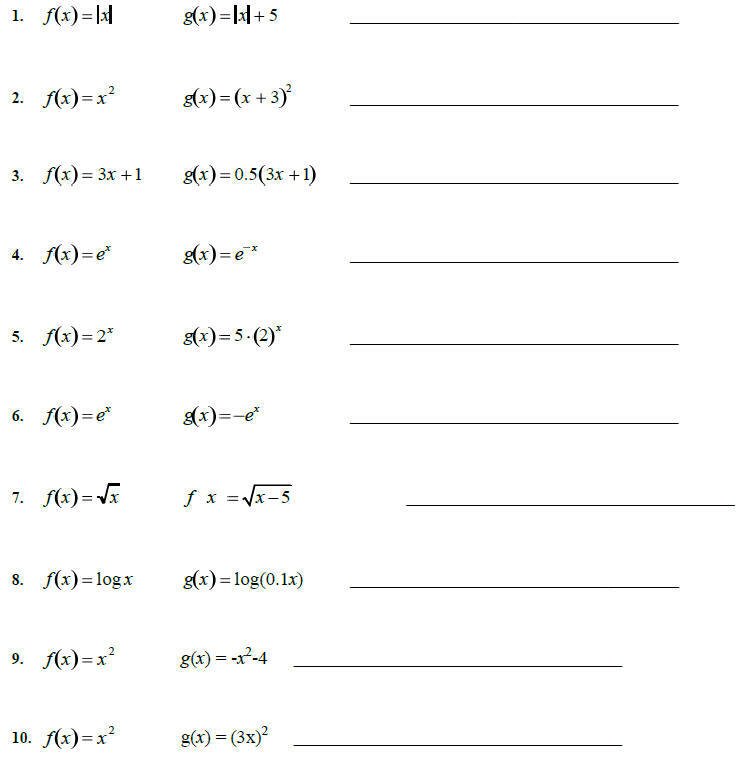 Write the transformation using function notation. 6. Describe how function g is a transformation of function f in #2. Write the transformation using function notation. flexible in moving from one format to another depending on what information you need. Is the vertex a maximum or a minimum? Is the parabola concave up or concave down? 6. Is the graph of f concave up or concave down? What is the y-intercept of the graph? 1. Write a quadratic equation for a function with zeros x = 3 and x = -1. What is the y-intercept of the graph of this function? 2. Write a quadratic equation for a function with zeros x = 3 and x = -1 and a y-intercept of (0, 6). 3. Write a quadratic equation for a function with zeros x = -6 and x = 2 and a y-intercept of (0, 5). 4. Write the equation of a quadratic function whose graph has a vertex at (4, 2) and a y-intercept of (0, 6). 5. Write the equation of a quadratic function whose graph has a vertex at (4, 2) and a y-intercept of (0, -4). 6. Write the equation of a quadratic function whose graph has a vertex at (-7,-3) and contains the point (-3,-7).